While you don't necessarily grill the slaw itself, it makes for a wonderful side dish for almost any grilled meat, be it ribs, sausage or even fish. I love the creamy dressing and the sweetness that the corn adds to the slaw. 1. Grill (or blanch) the corn. Cool and cut from cob. 2. 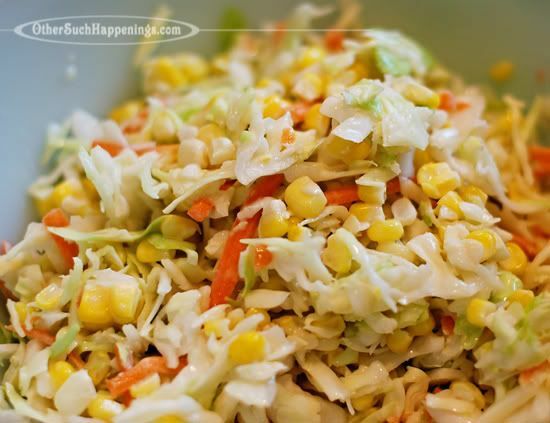 Place cut corn and cabbage mix together in a large bowl. 3. Whisk next 3 ingredients in a small bowl until combined. 4. Add to corn/cabbage and toss well. 6. Cover and refrigerate for at least an hour (or overnight), stirring occasionally. Head on over to Robyn's to see more On The Grill recipes. Marsha, I want to come over for some of that slaw right now. Even at this hour. That looks delicious! Thank you for linking up. You are simply awesome! That looks so good! I have never had corn in coleslaw before. In answer to your question I have no idea why they make those bumps on a slide. Don't ever try them though, your back would not thank you (Can you tell I speak from experience here?). looks SO yummy! cant wait to try it... and love corn in just about anything, sooo, this sounds perfect. I've never seen corn in a cole slaw before! Is that a southern thing? Saw this recipe on the Grill linky party. Looks delish!